PM Netanyahu takes off for Moscow, says cooperation between IDF and Russian forces in Syria 'has succeeded' and must continue to succeed. 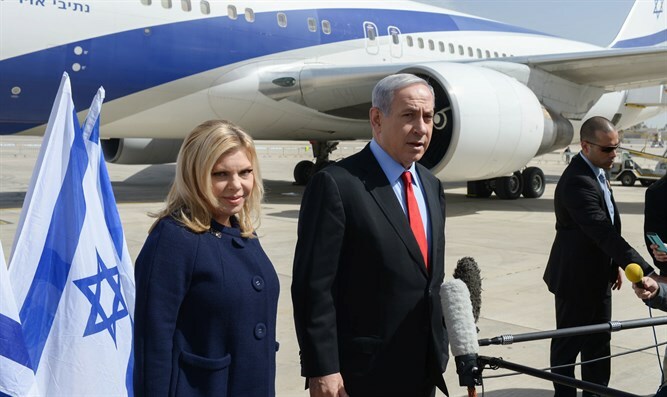 Israeli Prime Minister Binyamin Netanyahu spoke on Monday morning just prior to leaving for Moscow, where he will meet with Russian President Vladimir Putin. "I am now leaving for Moscow to meet with Russian President Vladimir Putin," Netanyahu said. "We meet periodically in order to ensure the military coordination between the IDF and the Russian forces in Syria. As of today this has succeeded and it is important that it continue to succeed." On Sunday, Syrian President Bashar al-Assad told Putin to pass on the message that "if Israel attacked targets in the country again, Syria would respond by firing Scud missiles at Ben-Gurion Airport." "Syrian honor is above all else," Assad emphasized. Putin promised to pass the message to Israel, and he and Netanyahu are expected to discuss the issue during their meeting. On Thursday, Israeli Ambassador to the United Nations Danny Danon warned the UN Security Council that Iran had amassed a massive fighting force of 82,000 in Syria, including thousands of Revolutionary Guard soldiers flown in from the Islamic republic. A November 2017 report said Iran is establishing a permanent military base outside El-Kiswah, located 14 kilometers (8 miles) south of Damascus. An airstrike attributed to Israel reportedly hit an Iranian compound in that area.